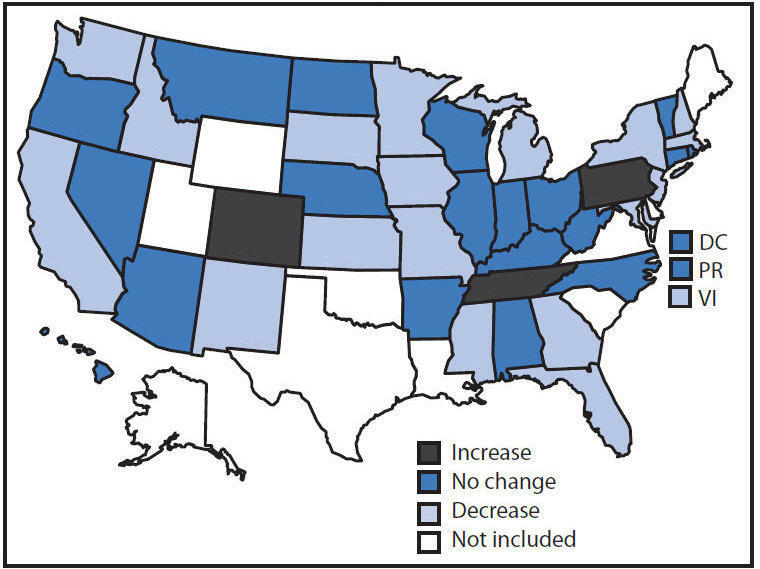 Rates of change in childhood obesity (ages 2-4) from 2008 to 2011.
Credit U.S. CDC Pediatric Nutrition Surveillance System, 2008-2011. *Represents statistically significant annual decrease or increase in obesity. 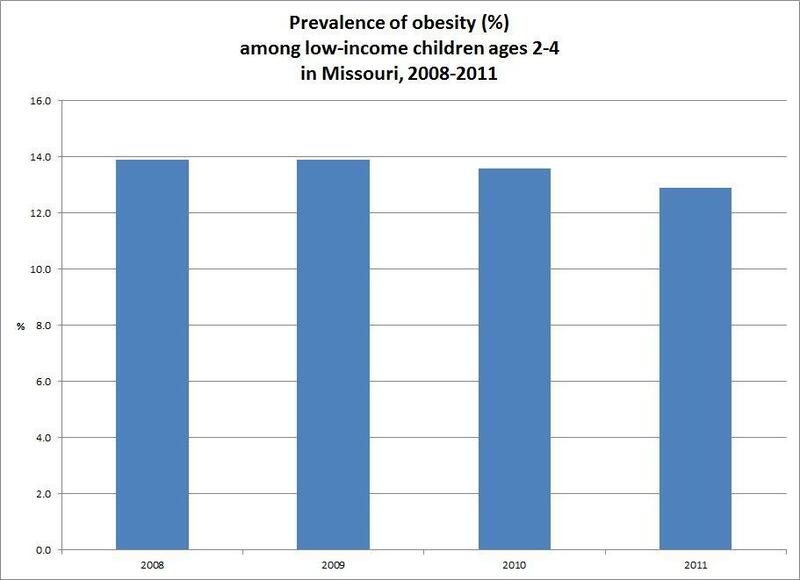 That includes Missouri, where rates of preschool obesity dropped from 13.9 to 12.9 percent. The report used weight and height data from the Pediatric Nutrition Surveillance System for about 11.6 million low-income children aged 2–4 years from 40 states, the District of Columbia, and two U.S. territories. 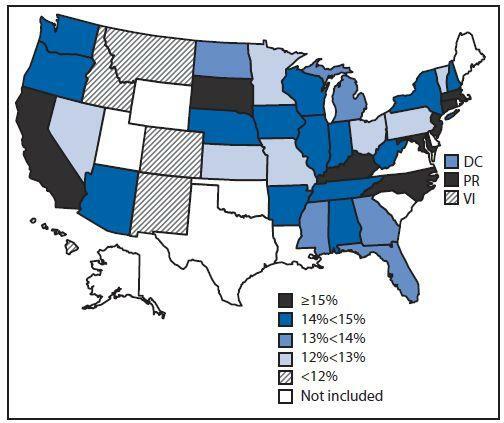 Prevalence of obesity among low-income, preschool-aged children in 2011. You can find more information from the CDC on how to reduce childhood obesity, here. A fresh analysis from the Centers for Disease Control and Prevention suggests the tide may be turning on the childhood obesity front. 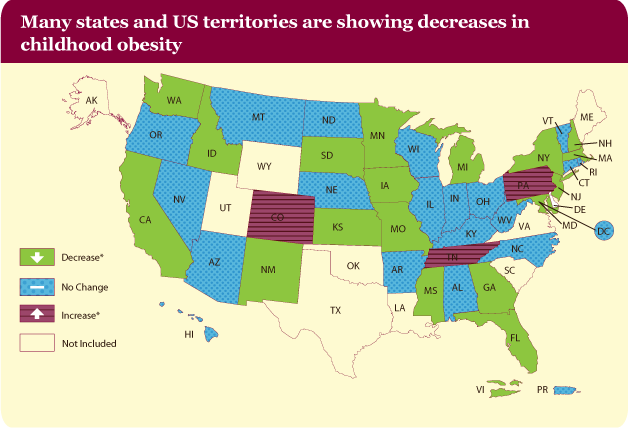 After decades of steady increases, 19 states and U.S. territories saw small decreases in their rates of obesity among low-income preschoolers. And another 20 states held steady at current rates. A CDC map shows several Southern states — including Florida, Georgia and Mississippi — that are part of the downward trend. Missouri is among 12 states cited in a new government survey with very high obesity rates. The Centers for Disease Control and Prevention released figures Monday showing that Missouri is among a dozen states with obesity rates of at least 30 percent. 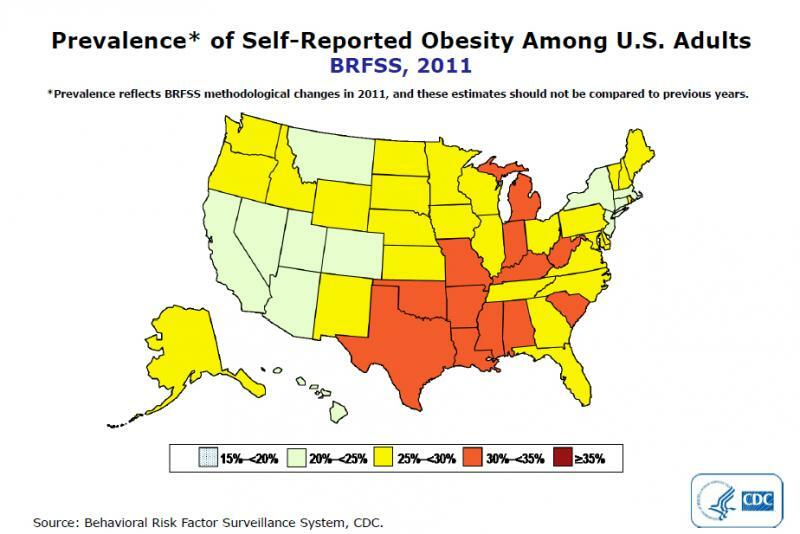 The CDC says 30.3 percent of Missourians are obese. Overall, more than a third of adults are obese. The latest figures are based on a 2011 telephone survey that asked adults their height and weight. For the first time, households with only cell phones were included.